Kindle is actually the collective noun for kittens, how's that for a fact? Night owls will be pleased to hear that Amazon's next Kindle is said to be front-lit so you can do away with those pesky reading lights. Reuter's source, who claims to have seen a prototype of the front-lit ereader, says the new Kindle will arrive in July in both Wi-Fi only and 3G versions. July, of course, being one of the months in which the nights are shortest - how's that for timing? What the new front-lit Kindle won't have, though, is colour – the source was quite clear on it running a monochrome E-Ink display. 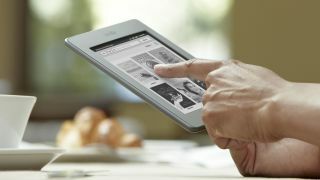 Rumours broke last week (by way of the ever-patchy Digitimes) that a Kindle Colour may be hitting the shelves in the second half of 2012. But Reuters now reports that there is "very little chance" of Amazon launching a Kindle Colour this year, although the company has apparently had talks about such a thing with E Ink so it may yet be in the works. As for the ever-elusive Kindle Fire 2, the front-light source said it will launch in time for the Christmas shopping season this year, with an 8.9-inch screen in tow.